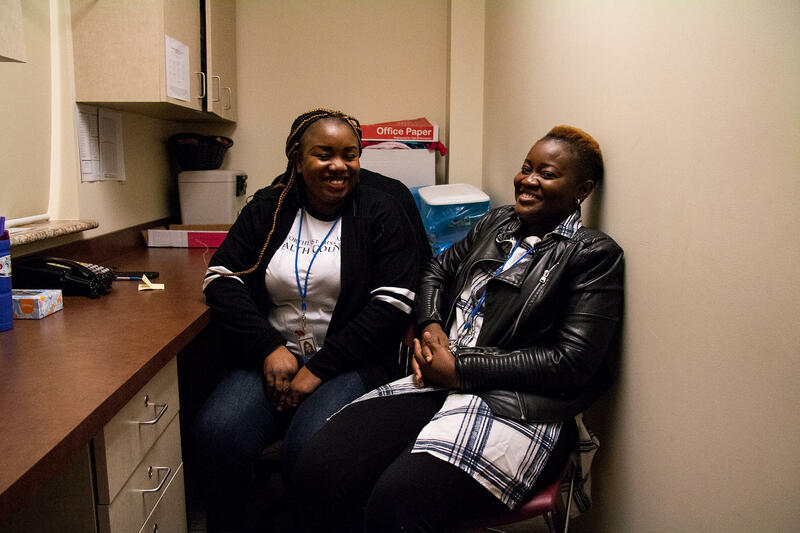 Bobette Nzuzi (left) and Lisette Chibanvunya (right), interpreters for the Northeast Health Council in Missouri. Since then, the town estimates at least 800 Congolese people have arrived in the area, many coming to work at pork processing plants. Among them is Chibanvunya’s colleague, Bobette Nzuzi, who says she was a doctor in Democratic Republic of the Congo. Like many skilled immigrants and refugees, she couldn’t continue her work in the U.S. without going through an extensive re-licensing process. Instead, she ended up working at the nearby Smithfield plant. "I was just [a] patient, and I used to work at Smithfield Farmland," Nzuzi says. "A friend told me about application for a translator, so I try and they hired me as interpreter." While D.R.C.’s official language is French, there are more than 200 languages in the country. For example, Nzuzi says, "Some people cannot speak French, they speak Lingala. For us it is easy because we can speak French, Lingala, Swahili, Kikongo." Before Nzuzi and Chibanvunya started working for the health council, doctors and nurses had to rely on automated translation services like Google translate. But that left gaps. Amanda Wilford explains, "They speak a different dialect of French, so you can't even tell the translator phone French sometimes, because they don't even understand that." Wilford is a nurse practitioner who runs the Health Council's clinic in Milan, 30 miles to the west. She says having someone like Nzuzi who can translate over the phone is a big help. "We just call her on a cell phone and she just pops off and on a cellphone whenever we need to call her," Wilford says. "She's a very busy lady." The Northeast Health Council clinic in Kirksville where Nzuzi and Chibanvunya work. Nzuzi and Chibanvunya both came to the U.S. through a State Department’s visa lottery. But thousands more Congolese have come as refugees. Last year, the U.S. took in more than 9,000 refugees from D.R.C. – nearly half of the total admitted. That country’s continuing political instability and ethnic conflicts have displaced millions of people. When refugees arrive in the U.S., resettlement agencies help with the language barrier. Dr. Aniyizhai Annamalai says, "They provide the fundamentals of helping them find housing, helping children find schools, helping the adults find employment." Dr. Annamalai is a psychiatrist and internist at the Adult Refugee Clinic at the Yale School of Medicine. She says these support structures can be critical for refugees’ health. "We talk a lot in medicine about the social determinants of health and especially moreso for refugees because they’re coming with nothing. So I think that basic foundation needs to be there." But in a small town like Kirksville -- where the nearest resettlement agency is an hour and a half away -- there’s more pressure on groups like the Northeast Health Council. And the interpreters help negotiate cultural differences as well. Chibanvunya recalls helping a patient who needed a c-section but didn't want one, because in the D.R.C. they can be a lot more dangerous. Chibanvunya says even though she could translate the doctor’s words, she had to do more to convince the patient it was safe. "That language problem, couldn’t make the person understand that this is the only way we can do," she says. "So I came in and then I helped the lady understanding and finally they ended up having the baby through C-section." Nzuzi wants to do even more for the area’s Congolese community. She’s working on her English skills, so she can begin the process of obtaining a medical license in the U.S.